A recent publication from the OECD looks at a looming problem for the global economy, a problem that has redeveloped in spite of the lessons taught by the Great Recession. I have posted on this subject before, however, the recent analysis by the OECD suggests that the economy could be on the cusp of another financial crisis. 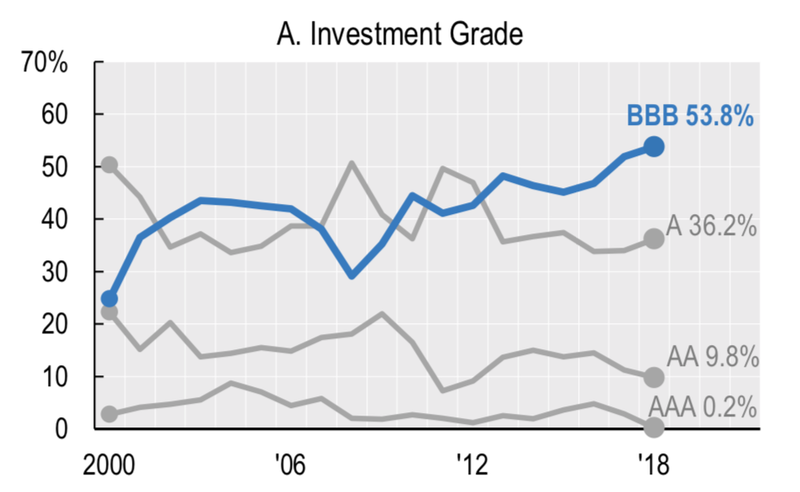 If a company’s credit rating falls below a rating of BBB or Baa, the grade of its debt changes from investment quality to junk status. 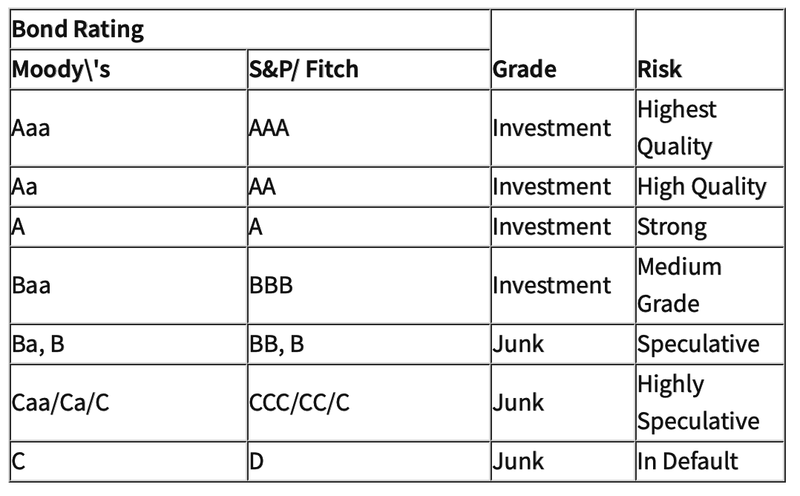 Junk bonds are the debt of companies that are experiencing financial difficulties which increases the risk to investors as well as the yield that they must offer to entice bondholders to purchase their debt. In the OECD’s Corporate Markets in a Time of Unconventional Monetary Policy, the authors provide a detailed look at the corporate bond world, using a dataset that is comprised of almost 85,000 unique corporate bond issues by non-financial corporations from 114 countries between 2000 and 2018. They note that since the financial crisis of 2008, non-financial companies dramatically increased their borrowing through the use of corporate bonds; over the decade between 2008 and 2018, global corporate bond issuance averaged $1.7 trillion per year compared to $864 billion in the years up to the financial crisis, a near doubling of the rate of corporate debt accrual. 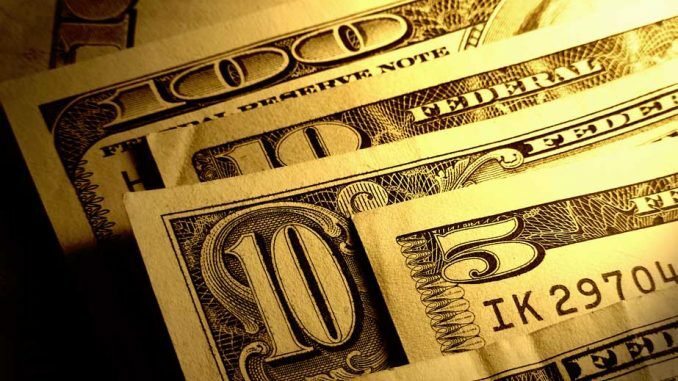 They also note that the global outstanding corporate debt reached $12.95 trillion, twice as much corporate debt as existed in 2008 when the level of corporate debt reached $6.53 trillion. Companies from advanced economies hold 79 percent of the total global outstanding amount in 2018, growing from $5.97 trillion in 2008 to $10.17 trillion in 2018. 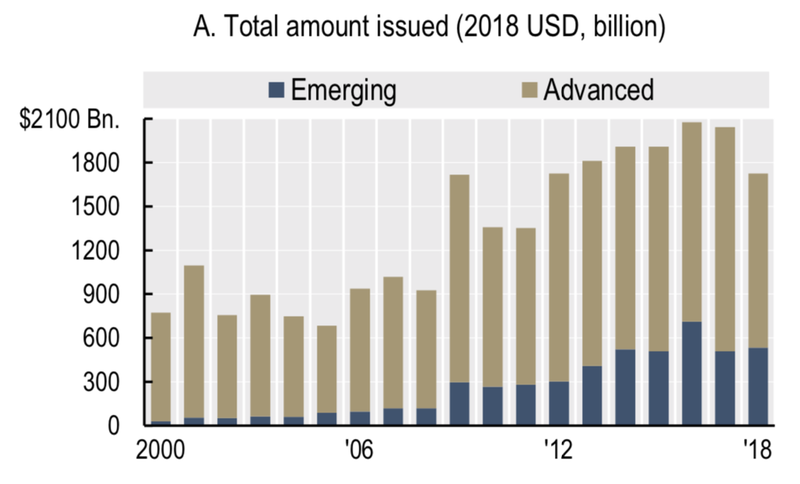 Companies from emerging economies hold 21 percent of the total global outstanding amount in 2018, growing to $2.78 trillion, an increase of 395 percent over a decade. 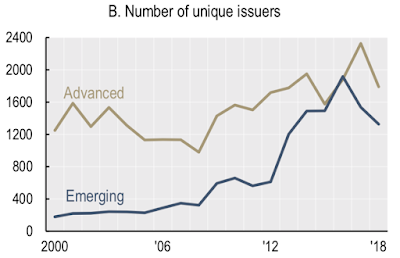 The number of companies in advanced economies issuing new corporate bonds rose from 1,133 in 2007 to 2,327 in 2017. 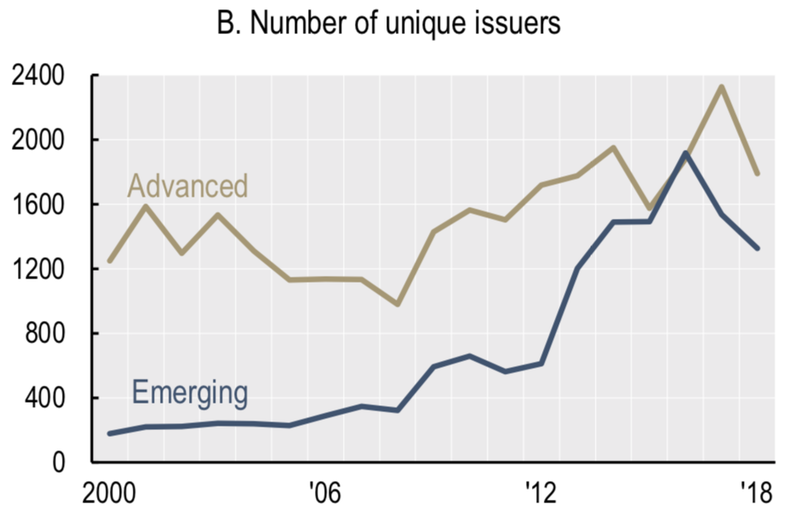 In the case of developing economies, the number of companies issuing new corporate bonds rose from 347 in 2007 to 1,917 in 2016. In both cases, the number of new companies issuing corporate debt has fallen in 2018. 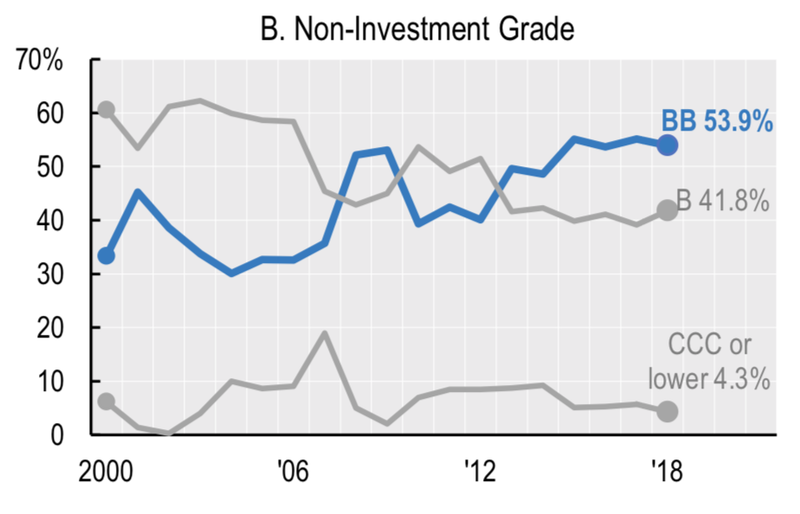 Note that the share of non-investment grade bonds plummeted to 7 percent of the total in 2008 and rose very sharply to 34 percent in 2010 and remained above or very slightly below 20 percent from 2011 to 2018. 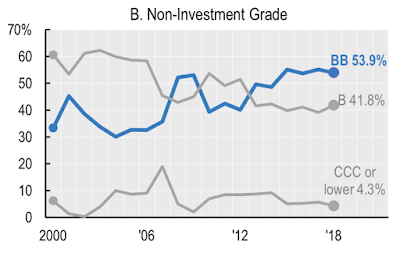 This is the longest period of time that the share of non-investment grade bonds has remained this elevated before a downturn sets in and default rates rise as they did in 2008 and 2009. As you can see, the percentage of BBB-rated bonds (the cutoff point between investment and junk grade bonds) grew at the expense of higher rated bonds, reaching 53.8 percent in 2018, the highest share of BBB bonds issued going back to 1980. 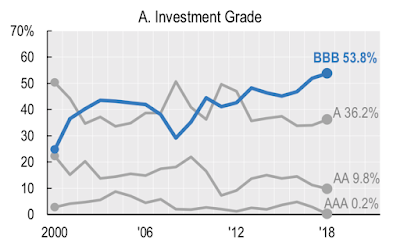 In this case, there is a shift toward higher rated BB bonds whose share rose from 35.2 percent in the period before 2008 to 53.9 percent in 2018. 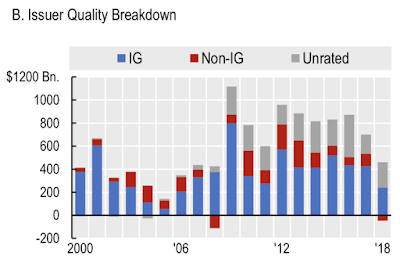 The authors also note that a financial shock similar to the 2008 crisis could result in $500 billion worth of BBB-rated corporate bonds being downgraded to non-investment grade within a year, forcing sales by non-investment grade investors. This figure could become even worse if a major issuer in the BBB category saw its credit rating drop, similar to what happened in 2005 to both General Motors and Ford Motor Company. 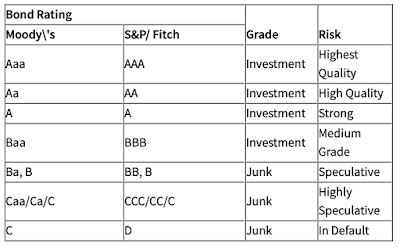 Corporate bond buyers – caveat emptor. You have been warned. MARIAH CAREY’S NEW MANAGER: SHAKING THINGS UP IN A GOOD WAY?